Marketing your small business doesn’t have to take a huge budget with thousands (or millions!) of dollars. As a small business owner, you likely don’t have the budget anyway. 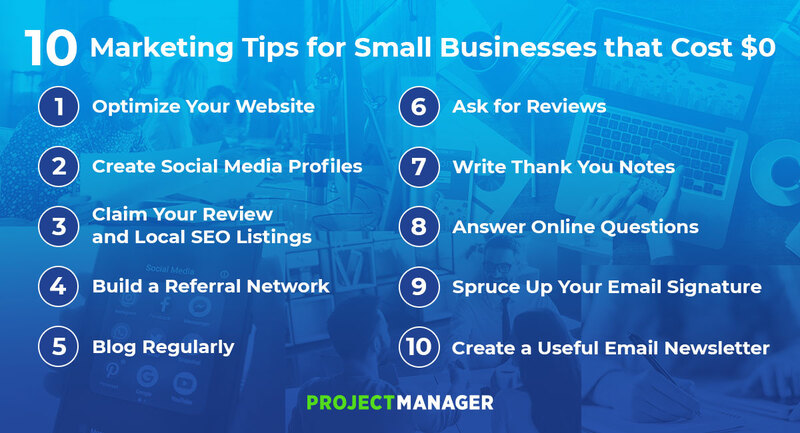 Before spending money on marketing projects that could be spent on something else, consider trying these ten marketing tips for a small business that cost nothing but the time it takes to learn and maintain them. One of the easiest things you can do as a business owner is to make sure your website is in tip-top shape with the basics of SEO. You don’t have to be an SEO expert to have a website that has a good foothold on the minor necessities. For instance, if your website was built on WordPress, you can install the Yoast SEO plugin for free, and it will walk you through setting up the basics of SEO for your site. It also automatically creates a sitemap and optimizes your meta title format, making it easier to complete the rest of the basics on your own. These guides break down the principles of search engine optimization quite easily, making it possible for almost any small business owner to get the hang of the basics! If your company isn’t on social media yet, now is the time. Every business should have a Facebook page, but the other social media platforms, like Instagram, Twitter, LinkedIn, and Snapchat, aren’t required unless they fit with your target demographic. For instance, a plumber likely isn’t going to gain a lot of traction on Snapchat, whereas an e-commerce clothing retailer likely would. This is because Snapchat’s audience skews younger, usually 18 to 30. Most of these people are not homeowners, so pushing content to them wouldn’t be worth it from a plumber’s perspective. However, since an e-commerce store can include links to clothing pieces in their snaps, it could be a great way to drum up business. Even if your business isn’t directly serving your immediate area, you still need to make sure you have claimed all the local review sites and local SEO listings. This will ensure that all the information is correct on these listings, which are often auto-generated, even if the business owner doesn’t know about it yet. Once you claim a listing, you can enter your contact information, add photos and respond to reviews. It’s important to respond to reviews out of respect to current and potential customers. One of the best things small businesses can do is stick together. If you offer services in a specific niche, look for other related providers that you could partner with for referrals. For instance, a wedding planner could have a few photographers on hand that she knows are great to work with that she can recommend to her clients. The photographers would hopefully do the same for the wedding planner. The best way to build this referral network is to build the relationships first, so there is an element of familiarity and trust. In many cases, cold calling or emailing someone to strike up a referral partnership isn’t going to work, as they don’t know your work and aren’t able to vouch for you. For this marketing tip, start by looking at other vendors for your clients to see if there are opportunities to get to know these other small business owners. Blogging has a wide variety of benefits for a small business, from getting more exposure via organic search engine results to establishing your business as a thought leader in the industry. If blogging seems overwhelming, start small with just one post per month, then scale up to bi-weekly or weekly as you get more used to the process. If you have employees, you can also share duties and ask everyone to take turns contributing to the blog. The variety of perspectives will add more depth to the blog posts, which helps keep the content interesting. Ask your existing customers to review your small business on Google, Yelp, or other major reviews sites (like TripAdvisor if you were a hotel or tourist-based business). Simply asking can remind them to do so. More reviews can lead to better visibility in review site search results (though this isn’t a guarantee). Just make sure you aren’t pressuring anyone to leave fake or deceptively positive reviews. Customers should feel free to leave their honest opinions. While this marketing tip does require the cost of stationary and stamps if you aren’t delivering them by hand, showing appreciation for your employees, vendors, and customers goes a long way. The note doesn’t have to be fancy—even using a blank postcard or notecard is enough. Writing thank you notes is a little touch that can make your business more memorable and more likely to be recommended to friends and colleagues. Wag.com, an online pet supply company, sends out a hand-written note or postcard after a customer’s first order with them. This makes the company more personable and relatable. If you are in a niche industry, especially one that is confusing at times, spend 30-60 minutes a week answering questions online. Forums like Twitter Chats, Quora, and Reddit are full of users that want to know more about topics in your industry. Taking the time to answer can help establish thought leadership but may also drum up interest in your company and its products. Don’t be overly promotional in your response: being helpful should always be key. Just make sure your profile is filled out so users can visit your website if they found your answer interesting. Some users don’t mind others linking to their products or website content, but only if it truly answers their question. Your email signature may be the most neglected or forgotten potential part of your marketing strategy. It will be seen by everyone you’re sending an email to, but often times, business owners don’t include anything useful at the end of their emails. Use a service like Wisestamp to curate your own professional layout, or just create one in the email settings of the email provider that you use. You can include your latest products, blog post, social media profiles, or link to your website. Many email marketing providers have free level accounts: take advantage of this by creating a useful email newsletter for your current and potential customers. Add new and existing customers to your email list (while making sure to follow proper opt-in guidelines), and then offer a subscribe box on your website to add new subscribers. Every month or week, send out a helpful email newsletter with company news, interesting external articles, product sales, or other information that your customers would find useful. This helps keep you top of mind. Incorporating some or all of these $0 marketing tips for your small business is sure to make a major impact. Make sure you don’t take on more than you can handle and schedule a time to complete them regularly on your calendar, so they don’t get lost. Soon, you’ll have a well-run marketing strategy that didn’t take thousands of dollars to start. Now that you got that million-dollar marketing plan for cheap, it’s time to use your excess budget on the right tools to plan, track and report on your success. ProjectManager.com is a cloud-based project management software with the features you need, including a real-time dashboard and online Gantt charts. Try it today with this free 30-day trial.